Bubba recently went to her first big girl party, with lots of children she doesn't know, I was nervous that she would be shy as large groups of people aren't really her thing. I needn't have worried, she had a great time - especially enjoying herself on the bouncy castles. I thought I'd share the details because Bubba never having been on a bouncy castle before, once accustomed to it, wouldn't get off. Not even to eat! It's also nice to have a company recommended as it can all be a bit of a minefield otherwise, knowing what to get or where to get it from. These smaller castles are great because at the party two castles fitted into the hall we were in. So there was plenty of room for all the littles ones and they could choose to bounce in the princess or Hero castles (or both, one after the other, as bubba did). So if you are in the market for a bouncy castle and you live in the south east then check Beyond Bounce out. It certainly keeps the little people quiet! Bubba loves to feed herself now but still also likes me to give a helping hand from time to time so when we received this MAM Cutlery set I was quite excited to try the set out. They are smaller than any spoon and fork combo that we already have, the handles are made of a strong rubber that wipes clean and is easy for Bubba to grip. Today she had one of each in her hands and was taking turns in shoveling the food in, she seems to find them easier to hold and use. I've noticed that her aim is more precise using these and she isn't left chasing food around her plate, both have a deep scoop on them (but not too deep that once in her mouth the food doesn't come off the spoon). Another great thing is that already we have used these with quite strong coloured food such as spaghetti bolognese and they haven't stained the plastic (unlike some of her other spoons and forks). The knife is brilliant because it has a slightly serrated edge and as you can see from the photograph above, it's shaped to fit little hands. We have used this out and about when I've needed to cut up Bubba's food for her, she isn't at the stage where she is cutting her own food up but she did use the knife to transport some rice to her mouth and I wasn't worried that the serrated edge would hurt her mouth because it wasn't too pronounced. I would recommend buying this set and I always now pick them out of the cupboard instead of her other sets. We were sent the cutlery set for review but all opinions are our own. As soon as Bubba was no longer making a mess of her clothes (so I didn't have to take a spare set out) and was less prone to explosive nappies that required me to take about eight out at a time, and as soon as I relaxed and stopped taking everything she could ever possibly need out, I found I no longer had a use for a separate nappy bag. I now take her lunch box out and she can often be found carrying this herself, I'm very pro making your child do some work! I found I could incorporate some wipes and a couple of nappies in my handbag but lately it seems to have got very heavy. Yesterday I investigated the contents and thought I'd share what I'm currently lugging around on a daily basis. Three happy people - these little people have saved me in so many situations since Bubba could grasp them in her little mits. I whip them out when we are in a restaurant or usually Costa coffee (I'm slightly addicted) and she can play happily with these three people for ages. We sometimes give them blankets (courtesy of costa) or generally just make them kiss each other which is an obsession of Bubbas at the moment! Numerous hair clips - what is it about toddlers and hairclips, she is fine with one in until you point out that she has one in and then she takes it out to show me. I can then never put it back in again or we have a twenty minute game of me putting it in and her taking it out! They seem to gravitate to my bag and multiply! Two bags of wipes - do I need two? I am at the point of finishing one bag and starting the next which is just plain annoying. As soon as I only take two wipes out, it'll be the day she spills something or makes a real mess! Nappies and nappy bags - need no explanation there. Instant hand sanitiser - I got this after we all came down with the same tummy bug in one weekend, it was a killer bug and floored us all. So now I aim to try and give our hands a wipe when we leave nursery (or arrive) because it seems the germs breed in that little class room. My makeup - on work days I can never make it out the house with Bubba in time so I grab my makeup on the run and put it on at work (if I remember). Books - again these little books help us out of boredom, Bubba likes taking them out and putting them back and taking them out again. Also they make a nice house for the happy people. What do you carry around daily? And have you found that you now have one arm longer than the other and the other one with more muscles from carrying the baby! At our weekly ballet class, there is a mixture of older girls (nearing age 3) and the little girls (youngest 18 months). We only moved up a group about two months ago so it's all very different and Bubba isn't interested in her peers but loves to run after the bigger girls and try and touch them. In turn these bigger girls (there are about five) look at her as if she is a little freak and back away. She still chases them thinking it's all a big game and smiling all the while. Except this week one of them didn't turn away and run off, well she did but turned back then decided to hug (in the loosest sense) bubba. Her mum was busy texting or chatting or could have been both as she is never watching her child. This girl was a little rough which is understandable at 3 but then she shoved bubba, quite hard, making her stumble backwards a bit. I didn't know what to do, my instinct was to jump up and go and get my baby but I didn't, I sat because I figured that I can't always wade in and she has to make her own way in the world of toddlers. I can't now get out of my head the look of astonishment and confusion on bubs face. She came over to me a bit teary and wanted a cuddle but how do you explain to a little girl who just wants to be involved that she won't always get a favourable response. She'll have plenty more of these encounters as she gets older and I want her to fight her own battles but a bit of me feels sad that she'll have to. 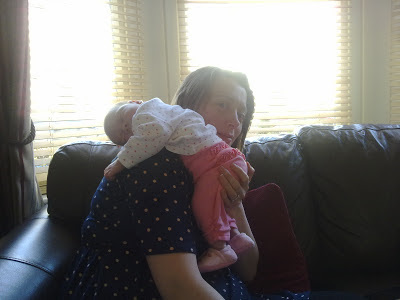 Aplologies for the long title but I hear so often how mothers to be should 'get all the sleep you can before baby arrives' and 'sleep when your baby sleeps'. Both of these to me seem silly and just one of those things you say, they aren't really helpful. My own experience of sleeping in late pregnancy was that it was mostly non existent, just when I'd get comfy in bed and start to doze, a small child would expertly balance on my bladder and I'd have to get up (slowly and like a hippo) and waddle into the bathroom to only then squeeze out the smallest possible dribble of wee EVER! This continued most nights and the rest was spent turning over and waking up or waking myself up as I lay on my back or right side (panic would then sweep over me that I'd slept on anything other than my left side and could have cut off vital supplies to the baby) and then I wouldn't be able to sleep again. As for sleeping when my newborn slept, well that didn't work, I was always too highly strung and waiting for her to wake or as soon as I managed to fall asleep she would instantly wake up. Game over! So below are my essential things to buy in pregnancy or early motherhood and how to get through it all. This is a must as it provides you at the end of a weary, nappy filled, day with a hot meal that was seemingly effortless. Lets face it, you'll be up early so putting the meat and some vegetables in the cooker and switching it onto low won't impact the rest of your day much. The benefits include the fact that it fills the house with lovely smells of comforting food all day and this is always good when you get back from another long walk to make the baby sleep. Your husband will think you are the best wife/mother/homemaker in the world and will be able to gloat in the office as he talks to people in a similar situation who had Chinese takeaway for the third night in a row. Just like the slow cooker, this allows you to throw some vegetables into the plastic compartment and turn the dial to ten minutes before you need your slow cooker meal ready and voilà, some iron rich, mood boosting goodness. Then when your little bundle starts weaning you can again throw some vegetables in and make beautiful purées without having to stand over a bubbling pan whilst baby screeches for your attention. Whilst heavily pregnant (whilst you can't sleep) record, record, record. Anything that may mildly take your fancy is fare game because when baby kicks in the middle of the night, you'll have something to do instead of staring at the ceiling panicking about child birth. Don't forget that once you've had your baby, there will be long days and nights of newborn feeds and changes and a bit of light hearted drivel will be exactly what you want. I got my Lakeland three tier dryer when pregnant and as it was winter, me and the bump sat contently and snuggly whilst all the little white clothes dried in preparation. I love putting it on when the weather turns because as well as being so cheap to run, it adds a bit of warmth into the room while I'm waiting for the timer on the central heating to click on. We have the smallest house in the world and can't fit a tumble dryer in and now I wouldn't want to, I love my dryer and the best bit is that it folds up flat when not in use. I'm a lover of magazines (more of an addict actually) and regularily buy magazines (like every week and that's just the glossy's). You need to find a magazine you love to read or aspire to and get it delivered to your house because as for TV above, there will be lots and lots of time sitting around during the day and night and flicking through a page or two is enough to give you a taste of real life again. It also needs to be delivered because with a newborn, there are some days and weeks where you may not get as far as the end of the road before baby needs a feed, poo, cry, sleep and your body just won't be able to propel you to the corner shop. The only caveat is that under no circumstances should it be a baby related magazine because these will only leave you feeling hollow and inadequate in the wake of the glossy mums with no sick down their front and a smile on their faces. Besides you have the real McCoy and there is nothing like on the job training! I wrote about Project Wild Thing here a while back and I think it's a fantastic aim to get more children up and out of the house and into the wild. It's a different world we live in today, a lot faster than generations before and our wants/needs are also more evolved but a lot of children aren't discovering the simple joy of regularly getting some fresh air whilst kicking leaves around and listening out for birds, or hearing a branch crackle underfoot. We love going outside, as a toddler Bubba has that natural curiosity that makes her want to be outside all the time and, more often than not, running around. At the moment the weather is perfect to wrap up warm and go kick some leaves about in the woods or the park. I've always been a lover of the woods, my nan and grandad always took my brother and I over the woods to walk and discover nature and I always feel rather nostalgic whenever I get the chance to just be amongst the trees and crunchy leaves or to see a squirrel scamper up a tree. Project Wild Thing need our help to carry on with the documentary, they need us all to make a pledge, which can be found on the Kickstarter website. Below is the description of what David Bond is trying to achieve and if you watch the trailer you will be inspired as I was. So please, please go have a look and see if you can help because we all need to give our children the experiences that can shape their lives for the better. "What will happen if we raise a generation of children completely out of touch with nature? Filmmaker David Bond thinks Mother Nature needs a helping hand. His children are fascinated by screens but are strangers to the natural world. Childhood is different to when he grew up - so many distractions compete for children’s time and attention. David appoints himself the Marketing Director for Nature and, with the help of marketing experts, he sets out to convince apathetic consumers, and his family, of the benefits of this amazing, free, wonder product. His journey takes him across the world as he attempts to untangle the complex web of agendas, fears, policies and habits that disconnect him and his family from the natural environment. 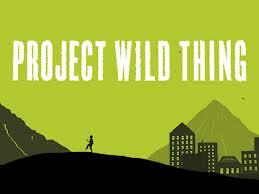 Project Wild Thing finds hilarity, joy and absurdity in the choices we face as 21st Century humans. What happens when we forget we are natural animals?" When daddy, at breakfast, said 'you are going to nursery today' you replied 'uh oh'. You currently don't like nursery and will cling to me and cry. Every week it breaks my heart a little but you seem to have fun whilst there and seem happy once back at home. I'm hoping you'll enjoy it more and want to run in but I can't see it happening any time soon. 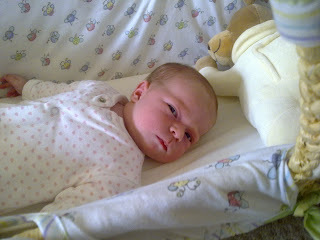 If I say nana would be cross if you do that (when you are being cheeky) you stop immediately. I'm trying not to over use the phrase in case it loses its power! You love to climb on everything possible. Whether this is an upside down Tupperware box, a children's watering can on its side, a ball (yes you tried to do a circus trick), to a table or tv unit. I really can't turn my back now. You are obsessed with ducks. We have to take a plastic little duck everywhere. At bath time you have at least five in the bath. You will point them out in the funniest places, I never knew there were so many ducks in every day life. Stars are shaping up to be your new obsession and you point them out all the time (now its nearly Christmas, you are in your element). I'm on the hunt for a duck with stars all over it, I'm sure I've seen one somewhere. Instead of answering 'yes' now you nod your head instead, this is very cute but a little inconvenient whilst I'm driving and can't always turn around to see if you've answered my question. You love older children and want to follow them around. If you are brave then you give them a little push and then laugh. You so want to be a big girl. Favourite words: mumma, nanna, duck, star and book. The other night I hauled my body of the sofa and went out to a two hour baby first aid course run by NCT and the Red Cross. I've completed an adult course in the past but decided I really should know what to do if anything happened to my baby or someone close to me. It's funny isn't it, the most important thing is our bodies and yet not many people know how to save a life. This was only a two hour course so the information was packed in and although we might not know what to do properly in an emergency, the main message I came away with was that if you act with confidence, you can't make the situation any worse. Just the fact you are acting is helping. I won't go through the steps for each because the videos are so concise and I urge everyone to take a look at these informative videos on the Red Cross website for children from time to time. You never know, it could help. Last month I wrote about my wants yet couldn't gets but since that post I seem to have acquired two of the things featured so I'm not so sure how well I'm doing in stopping my coveting! Hubby and I came across this brilliant product at the recent Baby & Toddler show being held at Bluewater in early October. It's a baby blanket that allows you to lift your baby with the minimum of disruption to either yourself or the baby. As the photograph show, baby is secure and supported and it saves lugging the moses basket up and down the stairs (as we did to start out). If we end up having more children then this is definitely going to be on my hit list but for now it's on the covet list. I have the idea that Bubba would love a kitchen for her birthday but I'm not sure if it's because I'd like to have a play with one again. What child doesn't like to pretend to cook and sort pans out? I love this wooden kitchen (so much in fact that I seem to have stuck one into the side of my blog). I like looking at it so don't really mind that much. I want, want, want one of these, I don't particularily care what colour - although I love this Ice blue, I don't really know what I'd do with it but it would make me fat, I know that much. I would joyfully be making cakes with this beauty left, right and centre. Family and friends would be sick of me bringing them things to eat because I just wanted an excuse to use my kitchen aide. They have a new range of woodland wall stickers out that start at an impressive £20 and can be personalised with your child's name and also the style can be changed. They are great to instantly change a room without doing anything too drastic and if you have two children in one room then there are all sorts of potential to personalise their individual areas. Lovely woodland animals make these magical and practical, a big love from me for these.